MYRTLE BEACH, S.C. (September 6, 2018) - Former Myrtle Beach Pelicans outfielder Ryan Cordell made his major league debut Monday for the Chicago White Sox at Guaranteed Rate Field. Cordell is the 176th player, including rehabbers, to have played for Myrtle Beach and also in the major leagues. A native of San Diego, Cordell pinch-ran and scored a run in the White Sox's 4-2 win over the Detroit Tigers. He made his first major league start on Tuesday and went 0-for-3 with a sacrifice fly. Originally selected by the Texas Rangers in the 11th round of the 2013 draft out of Liberty University, Cordell played in 16 games with Myrtle Beach in 2014, batting .306/.371/.645 with two doubles, two triples, five home runs and 19 RBIs. 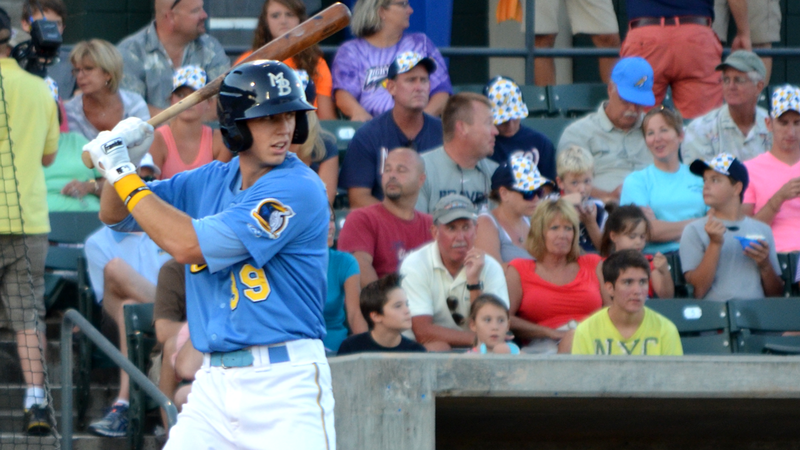 Cordell split the 2015 campaign between High-A High Desert and Double-A Frisco. He began the 2016 season with the RoughRiders, joining Bryce Harper as the only two players to crush two grand slams in the first three walks of the season. For those efforts, Cordell earned Texas League Player of the Month. Texas traded Cordell to the Milwaukee Brewers on September 5, 2016 as the player to be named later from the August 1 deal for Jonathan Lucroy and Jeremy Jeffress . Cordell began 2017 with Triple-A Colorado Springs, but was shipped in July to the White Sox for pitcher Anthony Swarzak . He did not play the remainder of the 2017 campaign due to injury. However, he hit .246/.286/.374 with 10 doubles, two triples, four homers and 26 RBIs in 51 games this season between the Rookie-level AZL White Sox, Double-A Birmingham and Triple-A Charlotte before earning his promotion to The Show. Six other former Pelicans besides Cordell have made their major league debut this season. Outfielder Billy McKinney played for the New York Yankees on March 30 before right-hander Pedro Araujo began in big league career on March 31 for the Baltimore Orioles. Infielders David Bote (Chicago Cubs) and Gleyber Torres (Yankees) made their debuts in The Show on April 21 and 22, respectively. Right-handers Duane Underwood Jr. (June 25) and James Norwood (July 11) made their major league debuts for the Cubs. The 2018 season was the 20th season for the Pelicans franchise and fourth as the Class A-Advanced affiliate of the Chicago Cubs. For tickets visit MyrtleBeachPelicans.com/tickets, call (843) 918-6000, or visit the Pelicans Box Office.